BrownJELO: I have another story...this time its funny (not gross). I have another story...this time its funny (not gross). I'm going to try hard to explain this, but no matter how hard I try it was definitely one of those "had to be there" moments. Its worth telling the story though...and picture me, telling this story literally "wheezing it" because I'm laughing so hard. That is what it was like for me to tell this story to Josh last night. I couldn't stop crying I was laughing so hard. We have a Dodge Caravan. We have a handy feature thats called "tailgate seating" where the back seats literally flip over backwards so that you can sit facing the back (like say, at a drive in movie or something). If you need better visualization of this, see this video...click on the tailgate seating link and remember that I have the 2006 version that is very similar but not operated by a cool little button. I had the three boys in the car and I pulled up to the front of my house to drop my SIL off at her car. I then had to keep going to pick Jessalyn up from school. My house is on a pretty steep hill so at this point we are doing quite a little hill stop (glad I'm not driving a standard). My van tends to roll back a bit so I knew I had to "gun it" a bit to get going up the hill. As I did that Ethans seat (in the way back) decided it wanted to be in the tailgate position! (remember...I am wheezing here..even as I type this story). 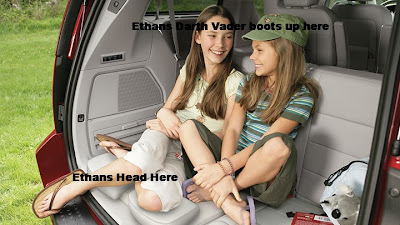 I heard a thump of sorts and while looking back to figure out whats going on all I see are Ethans Darth Vader moon boots sticking straight up in the air....(still wheezing)..and Ethan was IN THE TRUNK!!!!! ha ha ha ha ha. At first it took me a bit to figure out just what was happening. I sat there wondering how the heck that even happened (forgetting that our seats had that option). I then called my SIL back just so she could witness this event..knowing that in telling the story later nobody would believe me! I then got my phone out and was trying to get the camera ready for when I opened the back end of the van. I was too busy laughing at Ethan upside down in the trunk. This whole time I am dying laughing, Ethan is less than impressed. He was pretty ticked from the beginning (which happens to make me laugh even harder...its terrible). As I'm trying to get a picture he unbuckles his seatbelt and did a backwards roll right out of the van. I was bummed to not get a picture of this before he got out..but I can't blame him for not wanting to pose in that position. The only thing that would have made the story better is if Ethan had said "coulda done without that" right after it happened (you know, like Chris Farley after he crushed the bench in Tommy Boy). So, I know everyone is wondering if this is a safety issue with my van. I was worried for a split second, like something might be very wrong with the seats of the van. I then remembered that just before that very car ride the boys had gotten into the van first, while I was getting Owen ready to go. When I got in the van Luke thought it would be funny to 'surprise' me from the trunk of the van. He had climbed over the back row of seats into the trunk. In our van we just have this strap thing that is in the back of the seats that you pull to release the seats and allow them to flip. I am 99.9% sure that Luke must have pulled on this string because when I pushed the seat back up it seemed to latch fine...and I yanked on it with as much force as I could muster and it didn't move an inch. And of course, I can be glad that it happened like that and that we didn't drive around with an unlatched seat for months or something. And yes, it could have been very dangerous...but it wasn't and that is why I can laugh so hard at this situation! ..come on, laugh with me! Ok now I am laughing really hard!!!! I can just see Ethan's face!!! The I am so not impressed! OMG...that is hilarious! I'm sure not to Ethan, but I was laughing out loud with that story! Thanks for sharing...and you told it quite well cause I laughed along with you!! That is SO funny! We have the same van (well, ours is a Chrysler, but still) so I can totally picture it!